These cards were part of one of my Technique Classes. This technique is the grid technique done in two different ways. I like both looks - what about you? Score the Very Vanilla cardstock every 1/2 inch. I used the Scor-Pal to do this. With the indented side up, ink the Linen background in River Rock ink, lay the vanilla cardstock over it, and then with your fingers press down and over the cardstock. 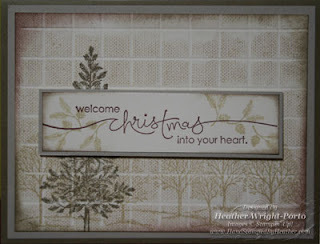 Lift cardstock and view the technique/look! I then stamped some trees in River Rock, including one large tree. Stamped another large tree in True Thyme. Sponged the corners with with Chocolate Chip (in 2 corners) and True Thyme in the other 2 corners. Stamp greeting in Chocolate Chip. Sponge edges of greeting cardstock. 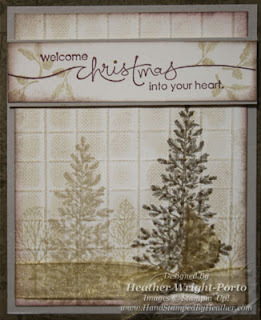 Wrap ribbon around layered Vanilla and Sahara Sand paper before adhering to card front! With the indented side down, ink the Linen background in River Rock ink, lay the vanilla cardstock over it, and then with your fingers press down and over the cardstock. I then stamped some trees in River Rock. Stamped a large tree in True Thyme.